GEORG KAJANUS (known worldwide as the leader, singer and songwriter of the group Sailor, whose songs include the hits ‘A Glass of Champagne’ and ‘Girls, Girls, Girls’) and TIM DRY (Shock, Tik and Tok) met in 1995 at the Bar Marseilles in Barcelona. 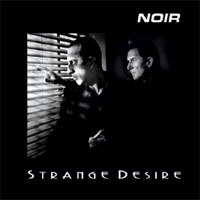 Sharing a mutual passion for black clothes, Film Noir and music, they decided to form NOIR. In 1997, everything moved at a rapid pace, with the promo of NOIR’s ‘Walking’ being featured on ‘TOTP2′ and ‘Live and Kicking’-before the single was even released. Channel 4 seized upon the opportunity for NOIR to host and feature their song ‘Walking’ in four, Eurocentric, gastro-pop videos in their new food programme, ‘Feast’. Georg and Tim also wrote the theme music to the show. Then the London Walking Forum signed NOIR up to produce another ‘Walking’ promo video. Now NOIR’s debut album obtains its first commercial release and includes on the CD an enhanced CDR promotional video of ‘Walking’. Enjoy!